From Toyota to Lexus, from BMW to Volvo, our panel of experts take a stab at evaluating a number of well-known automotive sites. They offer not only ones that their respective agencies created or co-created, but sites from other shops that they found intriguing and worthy of mention as well. What is unusual and effective about this website? Gallery Motomachi presents the "art of Toyota" in a way only the internet can, taking the unveiling theme of an auto show a step further. The name comes from the location of the first Toyota assembly plant in Japan, and the site portrays the vehicles being admired like artwork after coming off the assembly floor. The models highlighted include Yaris, Camry Hybrid and RAV4. The second section portrays three concept vehicles: Alessondro Volta, PM and CS&S. The microsite does a great job of introducing the new Toyota models and showcasing the latest vehicles and attributes. The opportunity is there for the user to drill down to get more specifics on each vehicle. The expanded real estate allows room to explore the overriding themes of affordability, fuel efficiency and environmental responsibility. The concept vehicles are guaranteed to garner some feedback, which is exactly what happened with the '06 FJ Cruiser to push it to production. 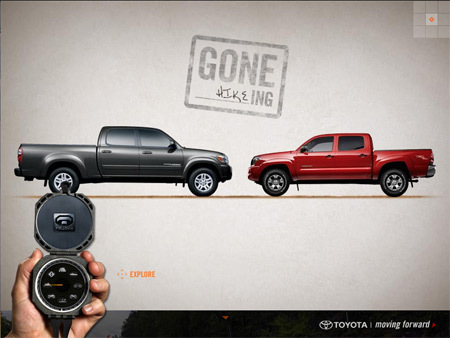 The tagline, "Gone __ing" (gone blanking), identifies with the lifestyles and leisure activities of a Toyota truck owner. Toyota, at the time, was preparing for one of the most important vehicle launches in its history, the new Tundra. This site does a great job of showcasing the versatility and capabilities of both trucks. This microsite provides enough real estate for nine blank-ings that speak to the core enthusiasm of truck owners. That enthusiasm even comes across in the different ways available to navigate through the experience. In the end, the attitude and personality of both trucks is clear. How does the website fit into and complement the overall brand strategy for the company? Toyota had many vehicle unveilings in 2006. And one of its largest online partnerships to help promote these launches was with eBay and eBay Motors, the passionate online community of millions of individuals and businesses. The program engaged the eBay community and drove demand for Toyota vehicles by tapping into the shared passions and principles of the eBay community and Toyota buyers. The program also allowed the eBay audience to experience Toyota in a new way (you couldn't get to these sites from anywhere else). How would you improve this website? Both sites could have provided the consumer with additional tools such as video, zooms, et cetera. This site is unusual and effective because it provides a consumer experience that is as good as being in the vehicle itself. Every feature of the vehicle is highlighted within a rich, interactive environment. It is very flexible and allows the consumer to make video selections and skip, pause and rewind. The quality of the intro Flash movie, images, video and 360-degree views match with what you would expect from the Lexus brand. 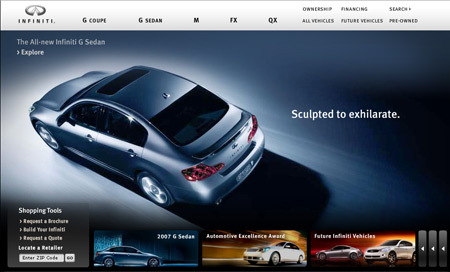 The look and feel of the entire site is modern and aligns perfectly with the Lexus brand. 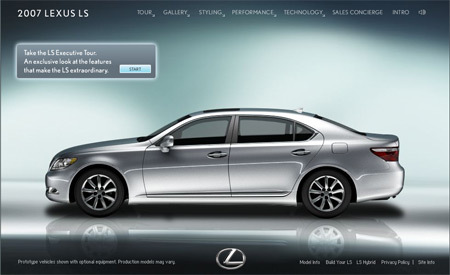 The way the microsite sits separately from the rest of Lexus.com points to just how special the LS is. This site could be enhanced with more raw videos, possibly shot from auto shows, test tracks, et cetera. Also, Flash interactivity (overlays) integrated within the videos could pull the consumer into the content even further. The site is highly visual, vibrant and modern. To reflect Infiniti's unique design sensibility and holistic emotional character, the site is designed to deliver content in a more progressive and emotional way. Featuring a large 10x7 canvas, cinematic full-screen imagery reveals how design transforms experience (in every Infiniti model and within the site itself). From interactive 360s embedded in the landing pages to the richly dynamic key feature content displayed within transparent windows within each vehicle section, the user discovery is self contained, intuitive and holistic. Infiniti promises a more modern and vibrant luxury experience, by design. 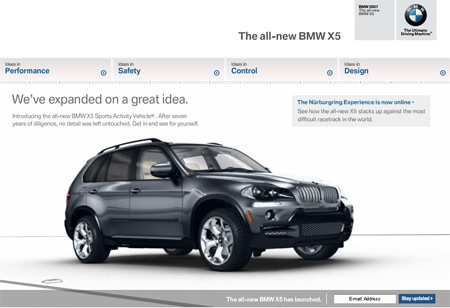 The site reinforces the concept of vibrant design from the moment you arrive at the homepage. The information is engaging and relevant, designed to motivate the user to move closer to the purchase decision. A recent benchmarking study has confirmed that the site has a highly positive effect on user perception regarding brand and intention to actually purchase an Infiniti. We've learned from discussions with our customers that they would welcome even richer interactive experiences, particularly in the area of product feature demonstrations. We are currently working on additional rich media content to add depth to both product experiences and brand design stories. The site integrates computer graphic (CG) imagery and motion in a way that creates an engaging experience for the consumer. Using CG allows the main content area to be expansive, and the CG images show the vehicle in a high-quality manner without the typical low-quality CG image artifacts. Cinematic-like effects during product storytelling is a unique and effective means of putting features in context of the entire vehicle and demonstrating functionality so that consumers can understand. BMW is a performance-driven automotive brand that runs the risk of an SUV lineup diluting that position. Closely associating the X5 with performance testing at Nurburgring helps to close the perception gap. It also appears to broaden the range of model categories that they are able to shroud in the "high-performance, high-speed tested in Germany" cloak that works so well for the M-series vehicles. While I think the content areas are good, I would look to integrate the content even further, reducing the borders between video and the overall canvas. Adding an organic and fluid integration between the transitions (CG on white backgrounds) and the content sections would present a more elegant and sophisticated design. The videos would benefit from being larger, which would decrease the awkward transition from the CG motion to the historical videos and interviews. 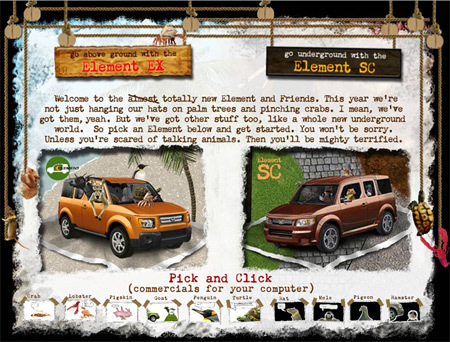 The Element and Friends campaign gently informs the public that the Element is a different animal, and the traits of some of these critters are easily likened to this vehicle. Whether we are speaking of traction, versatility or sound systems, a parallel in the animal kingdom can be found. This integrated campaign features everything from search to creative; all assets point toward www.elementandfriends.com. There, we weave a delicate and uniformly immersive experience for the user. We are dealing with users on the brand level, but allowing an easy path for exploration further down the funnel to product info, et cetera. It is a site that was sweated by everyone to come up with the right tone and paths, yet it feels simple and informal. For me, that is the true mark of online integration. This is a natural spillover from the visual and tonal qualities of the TV, radio, print and outdoor. All worked together to drive traffic to www.elementandfriends.com, where consumers were met with a soft and integrated landing upon arrival. This is definitely a brand-building experience, but at the same time it establishes affinity and mental bookmarks in the users' minds. People love the spots, and we offer another level of engagement beyond simply showcasing the commercials online. It is a waterfall strategy that really makes the user experience the guiding principle. Mostly, this question is based in theory, since many times creative staffers don't have the option to go back and recreate a website. But for us, because the campaign spilled over, we were able to use the basis of the site (once a day island) and, with the inclusion of new characters and the Element SC trim, add a whole new online dimension. So for this year, we were able to learn from our experience and build two working islands, one day and one night, which blended seamlessly together. Just like on the original day island, each friend has a unique and entertaining interaction with the Element and, in turn, the consumer. Because of the success and timing of the original, we were able to get unique content for the islands, voiced by the same talent as in the TV commercials. Doing more than simply repurposing TV spots online is a hard logistical task. But luckily, all our departments at RPA, from broadcast to media to online, are under one roof. Without that inclusionary fellowship, this site would not stand as the unequivocal brand experience that it is. This site does a beautiful job of introducing the feel of the new C30. The elements, presented through a cardboard box, work as a screensaver as well as a fun and purposeful site. The development of games and the ability to download the spots on multiple formats was cool (although I can't remember the last time I felt the need to download a car commercial onto my iPod, but that's just a personal thing). In fairness and to paint that in broader strokes, I would say no stone was left unturned in the development. The ability to rank commercials is cool and took some guts to put up, so I applaud them for that. This site has some depth to it, and it all feels fun and frisky while still getting out relevant product information. Bravo. Volvo has a very friendly and whimsical brand face of late, and this site definitely followed suit with its overall tone of humanity. Visually, the box metaphor was engaging and offered users a path of their own, with no clear directive other than the thrill of exploration. Once you easily discover something fun behind the door, you want to go and find more until the entire site is unmasked. I think this is truly an area that this car company can own. Fun, young, vibrant and unorthodox. Who doesn't want that balance in their life? The initial video, whether it is repurposed from a TV spot or not, doesn't seem to fit in with the rest of the campaign. It is very self-referential, with headers like "carefully researched tagline withdrawn" superimposed on running footage. That area is a bit risky for a car company, especially when you have a family of other models that have adopted basic car tenets in their other advertising. Having worked in car advertising for the last 11 years, I have adopted the motto, "Never cut off a foot, because you will need to walk with it again." Not sure if that makes sense to anyone but me, but it can be a guiding principle I would apply here. Other than that, this is a delightful site and, once we are rooted in the box metaphor, all the copy and commercials deal with the overall idea of the site, engaging users and giving their opinions a voice. It is quite a gem. And yes, I would give a Volvo to the people who made the site. When we began the redesign process, we realized that there's not a lot of differentiation in the market. All OEM sites looked the same and nobody really stood out. That's why we recommended a black background to make the photography appear more dramatic. In addition, we revised the UI and navigation completely, allowing the users to access any information through one rollover and/or click. Although the site was designed for 1024x768, acura.com offers all the vital information in the smaller frame of 800x600 to ensure that each user can have an engaging experience. The site reflects Acura's new brand strategy and tagline of "Advance" by offering advanced features such as the interactive showroom, model experiences (mini-sites) and an innovative approach to features and options. At the essence of "Advance" is the consumer experience. Acura.com redefines it for OEM sites by offering immediate access to all tools/content at any point during the exploration process. Clearly, OEMs still have a long way to go until the shopping experience becomes less of a tool and more of an integrated experience. Acura's tools are among the best in the industry but they still don't satisfy the needs of the 2.0 consumer. 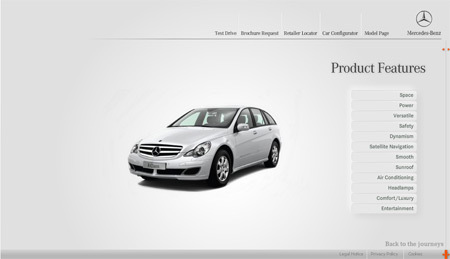 Unlike other OEM mini-sites, the Mercedes-Benz R-Class UK site doesn't overwhelm the user with an array of features or a cheap sales pitch. Instead, Mercedes-Benz opted to focus on an introductory experience that engages the user. Clean. Elegant. It's also very inviting. The site allows the user to discover their own relationship with the R-Class and, even better, to choose their experience: lifestyle or car-focused. The site functions as an innovative invite to an upscale experience. Just like any good brand, Mercedes-Benz tells a story and tries to connect with the consumer. In an increasingly competitive market, Mercedes-Benz sticks to its story and brand voice: unlike other mini-sites, the R-Class site finds a perfect balance between words, phrases, characteristics and the visual aspects of the brand. The site allows the user to feel the car by way of unique animated visuals and inspired writing; just the perfect emotional connection Mercedes-Benz drivers crave. Content could have been a bit deeper. I would have loved to find out more about each journey: a detailed description of the actual participant or a "behind the scenes" feature. Last but not least, the orange slider can easily be overlooked.